We've got a great ProTech 8 Glove Offer and free gift going on through the weekend, so you should check it out! Right now when you purchase any of the well-loved and highly rated ProTech8 gloves you can get them shipped for FREE, plus, never lose your gloves again with the FREE glove strap that will come along in your order! You should know about the details of which gloves you have to choose from, yes? We'll tell you about the awesome ProTech 8 options right here and then you can choose which best suits you. 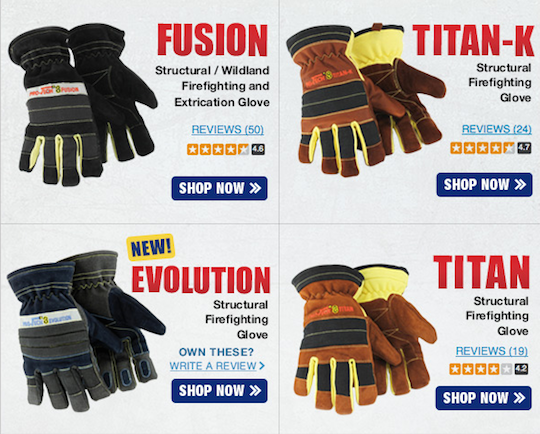 TITAN K is the premier NFPA 1971 compliant structural firefighting glove available today. The renowned PRO-TECH 8 multi-layer design coupled with the unique strength and flexibility of kangaroo leather results in an unmatched combination of protection and performance. See more ProTech 8 gloves on our site and choose the best fitting glove for you, today! Hurry now to get your free shipping and free glove strap through the weekend.